Organization: 4 Groups of 3 players working in 20x20 area as shown. 1 ball per player. 6 cones break the area down into 4 quarters. 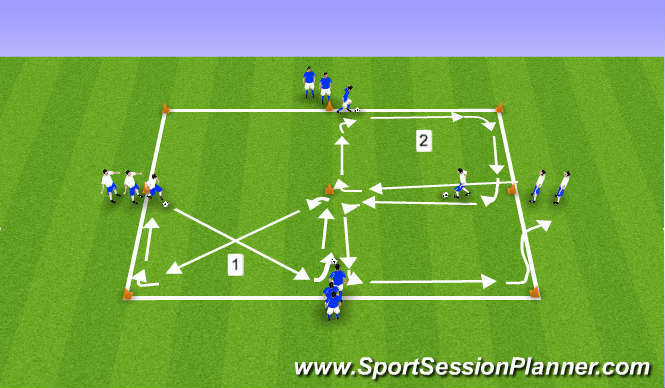 Description: 1) First player in each group dribbles diagonally across the square to his/her right and turns to the left using the left foot, just before the marker. Then turns to the left in the same manner and cuts diagonally across the saquare to the opposite marker turning to the right with the outside of the right foot, then dribbles back to the beginning. Next player performs the same sequence. 2) The first player dribbles the ball around the perimeter of the square to his/her right using the outside of the right foot to change direction. On returning to the starting point of player begins the process again this time using the left foot to turn to the left repeating the process in the square to his/her left. This time when the player returns to the starting point the next player repeats the sequence. - Work on both directions so that each player get to work with both feet.